NaturallySpeaking plays nicely with Outlook. In Dragon 12, you also get some additional commands for Outlook Express, Windows Live Mail, Thunderbird, and Gmail. If you use these e-mail applications, you’ll be happy to know that voice commands are an option for them, too. 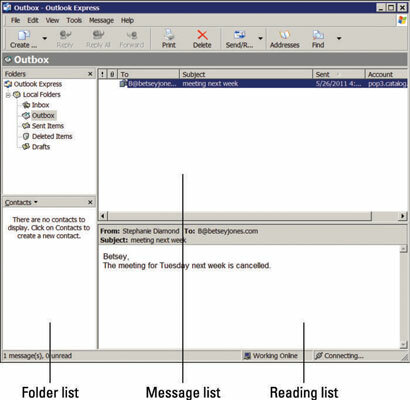 Outlook Express supports Windows operating systems up through Windows XP. (Vista uses Windows Mail. Windows 7 and 8 users must use another e-mail client.) Outlook Express’s most well-known feature is that you can use custom graphics. It also provides specially designed stationery templates for sending celebratory e-mails. If you started using Outlook Express long ago and are comfortable with it, you’ll be happy to add voice commands to your options. As with the other e-mail applications listed above, Outlook Express also uses the three-panel window. By following the menu commands, you can navigate entirely with voice. In version 12 of NaturallySpeaking, Nuance added some voice commands for Outlook Express that were not in previous versions. You can use the same commands with Outlook Express, Windows Mail, and Windows Live Mail shown below. When you move into the body field, dictate your message. When NaturallySpeaking is unclear about the instructions for Live Mail, it shows numbered options as it does in most other applications. Just as you would anywhere else, select the option by saying, “Choose <number>.” Once you get used to doing this, it’s easy to get around. If you use Thunderbird, Mozilla Foundation’s free e-mail client, you know that it’s an open source application and works cross-platform. This means that it is created by developers who donate their time and share code. It can be used with Windows, Mac, or Linux. If you haven’t used Thunderbird, consider it if you want to aggregate e-mails across several e-mail accounts. Thunderbird doesn’t send e-mail on its own. It lets you combine your accounts and work from one main source. It has several add-ons and lets you configure your e-mail account in a way that makes sense for you. After you set up and open Thunderbird, you notice that it looks like most other e-mail clients. It uses the three-panel window configuration: the folder list, a message list, and a reading pane. When you open your Gmail account in one of the browsers listed here, you will know if RIA extensions are enabled by looking to see if there is a green quote mark next to some of the commands. You may be prompted to load the RIA extensions if you haven’t opened the browser with Dragon 12 running. So click Yes if you are prompted. Also, make sure you aren’t using Gmail Classic. That will not work with Dragon 12. Gmail, like Thunderbird, is another Full Text Control application that doesn’t work with Natural Language Commands. But it gets the job done, and if Gmail is your application of choice, fear not. It can work for you. The e-mail window opens with the cursor in the address box. Move through the subject field the same way.